Laguna Lachua is one of the best conserved lakes in Central America. 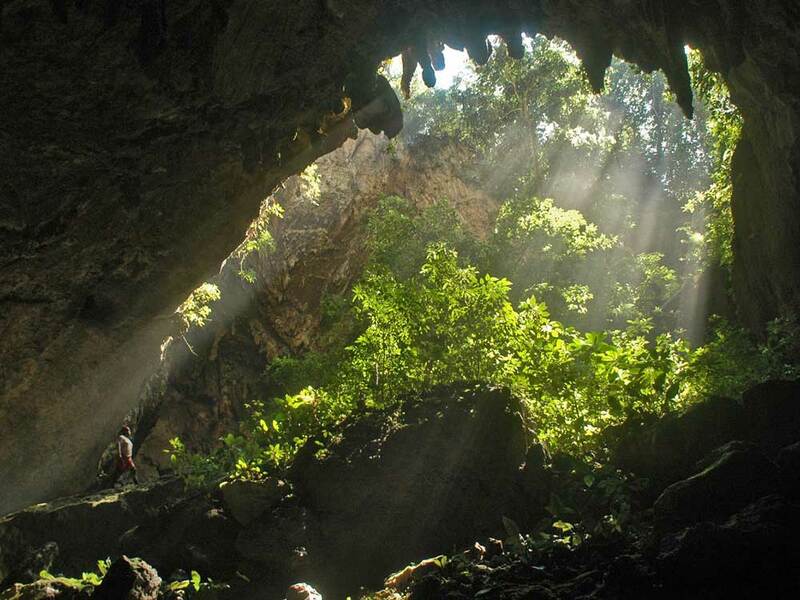 It is located 2 hours from Cobán and only accessible by public transportation. To get there, you take a bus to the Chisec crosspoint (halfway on the route from Flores to Semuc Champey) and from there hop on a bus in the direction of Playa Grande. It might be a little bit difficult to get there, but it is definitely worth the effort. To get to the lake one has to first hike for 1 hour through the pristine natural park. Remember, there are no restaurants there so you have to bring your own food and drinks. For accommodation you can either sleep in the community hostel or bring your own tent. 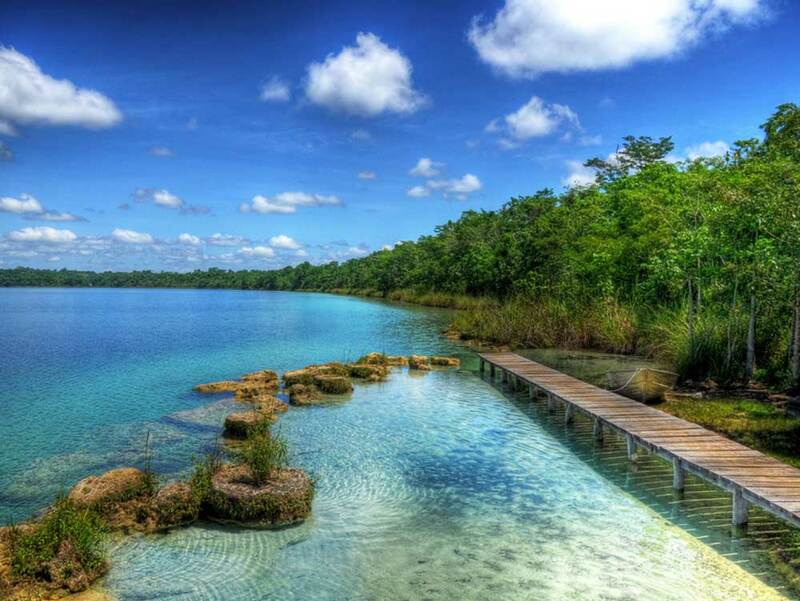 You’ll be rewarded with a stay at one of the most beautiful lakes of Central America. Just a little warning: This tour is for those that love to step out of the tourist bubble and are not afraid to get a bit dirty! Laguna Lachua is on the same route as the Candelaria Caves. You might wanna visit them both! The Candelaria Caves are one of the biggest in Guatemala and definitely one of the most beautiful we have seen. The caves are submerged in water and you can tube for miles through them. They are located just a few miles away from the Chisec Crosspoint, which is halfway on the route between Flores and Semuc Champey. It would be the perfect stop on the way. To get there just get out at the Chisec Crosspoint and take a collective bus to the caves. The basic, and in our opinion more fun, option is to stay at the communitarian hotel. Coming from Chisec it is the second entry marked by a big white stone sign next to the road. You will have to walk for 30 minutes through pristine jungle until you will see a little river with a thatched roofed hotel next to it. The hotel is a communitarian project of the traditional neighboring village. If no one is at the hotel just cross the little bridge and ask around in town. Soon you’ll be surrounded by smiling kids and someone will check you in at the simple but cozy hotel. The project offers traditional food and drinks. Probably the freshest chicken you ever had as they just catch them from their backyards. The hotel costs Q 85 a night per person and they charge the same amount for the guided tour through the caves! Only do this tour if you’re really in for an adventure as facilities are basic. However this is a unique opportunity to get a real taste of rural Guatemala. We couldn’t find any contact information for the project. The other option is to stay at a much more luxurious hotel called Candelaria Lodge which is located right next to the road so you won’t need to hike in for 30 minutes. They offer nice private rooms and have a restaurant on site.